Speaker Rebecca Kadaga had by press time failed to bring the House to order. Courtesy photo. KAMPALA–Members of Parliament were by press time still angaged in fierce fights after the Speaker of Parliament Rebecca Kadaga allowed the amendment of the Order Paper to include the age limit motion. Trouble started when Speaker Rebecca Kadaga announced that the age limit, among other motions, will be debated in this afternoon sitting much to the chagrin of Opposition legislators who wondered why the motion was ‘smuggled’ on the Order Paper. “Is it procedurally correct to ambush us with the age limit bill yet the one who presided over Parliament last week told us that consultations will be made before the motion is tabled?” Winnie Kiiza, the Leader of Opposition in Parliament, said. 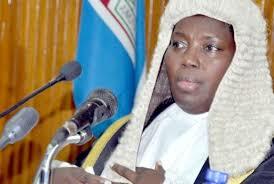 The Speaker said challenging the Order Paper is like challenging her powers as Speaker of the August House. MP Medard Ssegona of Busiiro North urged Speaker Kadaga to be as consistent as she has always been, arguing that the motions should be tabled in order beginning with the motion of Patrick Nsamba, Kassanda North MP, on constitutional amendments. Opposition MPs were also infuriated by claims that one of the NRM MPs carried a pistol to the chambers of Parliament, which is illegal according to Parliament procedure.